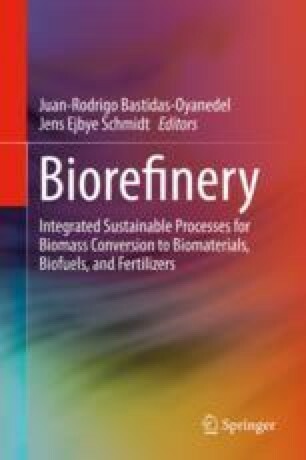 Biomass for biorefineries or in support of a wider bioeconomy can be sourced from various sources. Currently forest or woody biomass makes up the largest contribution to bioenergy production, but future supply potentials include dedicated production of biomass for energy or biorefineries and an increased use of agricultural or forest residues. By 2050 a technical potential of agricultural residues between 10 and 66 EJ has been identified, constituting a significant resource. Also processing residues and food waste constitute a significant biomass resource each with a potential between 5 and 50 EJ per year by 2050. Residue biomass, be it from the field or from processing of agricultural produce, has a low cost compared to other biomass resources. However, due to its low energy density and geographically dispersed production, long-range transport is prohibitively costly, which could limit the biorefinery concept from being broadly implemented. Development towards densification and to ensure uniform material characteristics may reduce cost and risk in the supply chain. A significant resource base at a reasonable cost and with a manageable risk is not enough to ensure mobilisation of the resource and the establishment of a viable supply chain. A number of institutional, technical, social and economic barriers must be overcome. A consistent policy framework that supports a bioeconomy, biorefineries or production based on biomass and waste is required. Awareness about credible knowledge on process costs and sustainability aspects must be developed among stakeholders along the supply chain.